'Shogun' needs to leave Australia with a win if he wants to avoid the retirement talk. Just days ago, Mauricio Rua turned 32 years old. If you listen to some people, the emphasis there is on old. 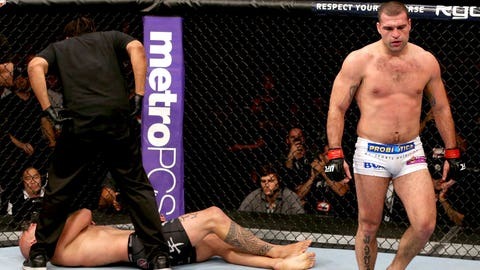 Once regarded as nearly unbeatable, Rua has had no real extended success in the UFC, where his career has been a dizzying roller coaster of ups and downs. True, he won the light-heavyweight championship in 2010, but that only came after he was rewarded an immediate rematch after losing in a close decision. Since winning the belt, he’s struggled, going just 2-4 in his last six fights, including the first two-fight skid of his career. In his last fight, he was submitted by Chael Sonnen, a fighter who before that point had only tapped out four opponents in 42 matches. It’s gotten to the point where there is a palpable sense of uncertainty about Rua’s future and doubt about whether he can turn his fortunes around and recapture the magic of his earlier days. In fact, UFC president Dana White said on Wednesday’s edition of FOX Sports Live that if Rua loses to James Te Huna at UFC Fight Night: Hunt vs. Bigfoot, they might have to sit down and have a talk that no fighter wants to have, about whether it’s time to hang up his gloves. I think every time we lose, it means we didn’t do our job the best we could. It’s not a topic that anyone preparing for competition willingly welcomes, but in his usual understated professionalism, Rua denied that the extra scrutiny will weigh on him come fight time. "No, actually, I don’t put any extra pressure on my career," he said on Thursday. "The goal is always to win. I don’t really put that extra pressure. My only obligation is to do my best, to try to perform my best. So I cannot really put that pressure that I have desperately to win. I have to go there and do my job." At least as far as the stylistic matchup goes, it is one to Rua’s liking. Always a feared striker, he remains dangerous anytime the fight remains standing. As evidence, note that each of his last two wins are by knockout. Yet it’s also a matchup that Te Huna requested. Coming off a loss of his own, to Glover Teixeira in May, Te Huna saw the opportunity to quickly rebound by facing and presumably defeating a top 10 opponent (Rua is still ranked at No. 9 in the latest UFC rankings). Te Huna said he expects that Rua will go for his weakest point, his ground game, which is responsible for five tapout losses, but Rua has always had the propensity to engage in a good, old-fashioned slugfest, and Te Huna would no doubt welcome such a dynamic. On the other hand, it’s certainly possible that Rua sees the enormity of the moment and becomes more risk-averse, settling on a more conservative game plan that increases his chances of victory. That’s something he vaguely alluded to when he was asked about some of his recent problems. My only obligation is to do my best, to try to perform my best. So I cannot really put that pressure that I have desperately to win. "I think every time we lose, it means we didn’t do our job the best we could," he said. "It’s always a learning lesson as an athlete. I have to learn with the losses and I try to take this into account and improve as a fighter, and bring the experience to the next training camps and do a better job." A win would certainly give him a reprieve, however temporary from the intense scrutiny that seems to be following him around these days. If he loses, however, he will clearly be at some kind of crossroads. If he has one lifeline to draw on, it’s his recent statement that he’d be willing to explore the possibility of moving down to middleweight. It’s a move that’s been suggested for some time, and would likely give UFC honchos more reason to keep Rua in the fold. Up until now, however, Rua has not seriously given too much thought to a move. While his original proclamation blew up in the media, in fact it came during a casual question-and-answer session with fans, and without much forethought. It was just something that came up in the moment. After Saturday, it could be a very real consideration. That’s not something he wants to dwell on in the final hours before his next match, but fighting is a human chess match, so the best fighters see future possibilities coming even before they arrive. In that way, they hope to avert the worst possible outcome. "It’s always bad to lose, always tough to lose," he said. "Obviously, as a fighter you have to be prepared for these kinds of situations but it’s never easy. It’s part of the game. I have to work hard like I’m doing to overcome this and be on top again."